"This is the most incredible pie. Cooking it in the brown paper bag makes the filling soft and juicy and the top crunchy. I have made this recipe for over 25 years and everyone who has ever eaten it can't believe how wonderful it is! I was given this recipe by my best friend and I think she got it from her friend's grandmother. After so many years I decided it was time to share it with the world! Serve warm with vanilla ice cream. Reheats very well. " To make the bottom crust, stir the flour and white sugar together in a bowl until well-combined. Rub the unsalted butter into the flour until the mixture resembles coarse crumbs; sprinkle with cold water, a couple of tablespoons at a time, mixing the dough together lightly with a fork until it barely holds together. Form the dough into a ball and roll it out to a circle about 1/8-inch thick. Gently ease the dough into an 8-inch pie dish. Cut off any excess pastry with a knife. Finish the edge of the crust by gently pressing the tines of a fork into the dough all the way around the edge of the pie dish. Set the crust aside. To make the pie filling, stir the apples, brown sugar, 2 tablespoons of flour, the cinnamon, nutmeg, ginger, and lemon juice together in a large bowl; set aside. To make the topping, mix 1/2 cup of flour, 1/2 cup of softened butter, and the superfine sugar together in a bowl until you have a sticky, moist dough. To assemble the pie, cover the bottom of the pie crust with a light, even layer of graham cracker crumbs. Fill the pie with the apple mixture, piling it up in a mound shape. Pinch off pieces of the topping mixture, flatten them a little with your fingers, and dot them at random all over the top of the filling, covering as much of the filling as possible. Tear off 2 30-inch-long pieces of parchment paper and place them in a cross shape on a work surface. Place the filled pie in the center of the two pieces of parchment, bring the paper ends up over the pie and fold and staple the parchment paper over the pie to completely enclose and seal in the pie. The paper should not touch the top or sides of the pie. Place the parchment-wrapped pie on a baking sheet to catch any drips. Bake in the preheated oven for 1 hour. Don't peek inside the parchment paper while baking. Remove from the oven, carefully tear the parchment paper away from the pie, and let cool; serve warm. Store leftovers in refrigerator. 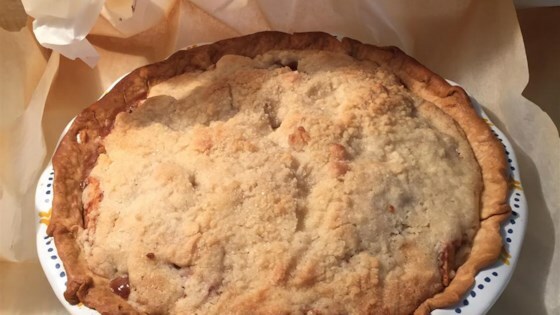 Due to food safety concerns with lead from ink, possible contaminants in recycled paper, or fire, it's better to use parchment paper to bake the pie. Original Baking Directions: Place pie in a large brown supermarket bag on its side, not standing up, making sure the bag does not touch the top or sides of the pie. Carefully fold over the opening of the bag and staple it closed to seal the pie in. Bake at 425 for one hour. It will smell like the bag is burning in the first 30 minutes of cooking, but then you can smell the pie cooking so don't worry! My oven runs very hot so I cook this at 400 for one hour. An interesting baking method, which I'll use again. Average flavor. Crumb topping was not at all crumbly. This made an excellent pie. I didn't cook it in parchment paper or a brown paper bag, but it still came out well. This Apple Pie is amazing. . and the paper bag really works!! I made several of these last year with the apples from our apple trees. The neighbors enjoyed the pie as much as we did!! !